A new analysis by the Center for Biological Diversity finds that 500,000 students in California attend schools within a half-mile of rail tracks used by oil trains, and more than another 500,000 are within a mile of the tracks. Current safety regulations for first responders dealing with oil trains recommend evacuating everyone within a half-mile of any incident with an oil train. This wasn’t much of a problem for the most recent oil train accident in July in Culbertson, Montana because there were only 30 people within the half-mile radius area. However, in populated areas like California, potential scenarios could involve large-scale evacuations and casualties. 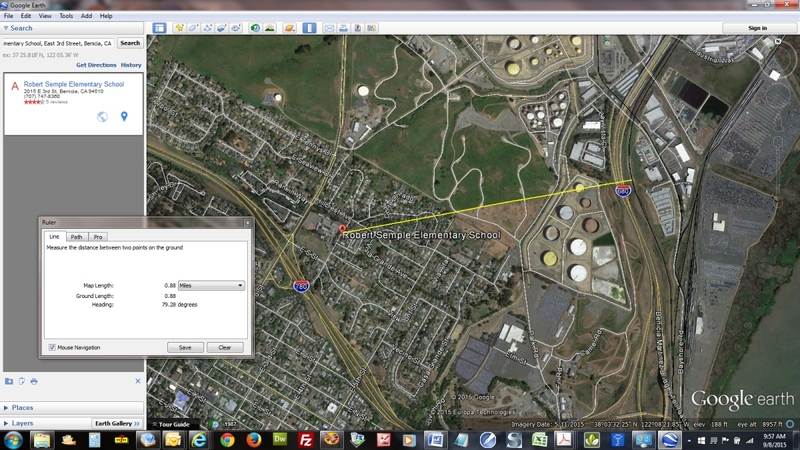 In addition to the threat posed to California’s students, the report Crude Injustice on the Rails released earlier this year by ForestEthics and Communities for a Better Environment, pointed out that in California the communities within the half-mile blast zones were also more likely to be low-income minority neighborhoods. As more communities across the country become aware of the very real risks these oil trains pose, opposition is mounting to new oil-by-rail projects as well as challenges to existing facilities. In Minnesota, Sen. Al Franken (D-MN) held a hearing on the subject and heard from concerned residents like Catherine Dorr, as reported by the local CBS station. In Albany, New York which is the largest oil-by-rail hub on the East coast, this week a coalition of groups announced their intentions to sue the oil company transporting Bakken crude through Albany and challenge the validity of the air quality permit the company received in 2012. And even in remote places like North Dakota, where much of the oil originates, the U.S. military is concerned about the proximity of the oil train tracks to nuclear missile facilities. With all of this concern about the dangers of oil trains, a new report by the Associated Press (AP) paints a troubling picture about the preparedness of populated areas to respond to an oil-by-rail incident. The report was based on interviews with emergency management professionals in 12 large cities across the U.S.
As noted on DeSmog, one of the reasons that the oil trains pose such a high risk is that the oil industry refuses to stabilize the oil to make it safe to transport. And the new regulations for oil-by-rail transport released this year allow for older unsafe tank cars to be used for another 8-10 years. While the regulations require modernized braking systems on oil trains in future years, the rail industry is fighting this and a Senate committee recently voted to remove this from the regulations. The reality is that unless there are drastic changes made, anyone living within a half mile of these tracks will be at risk for years to come. And while oil production isn’t increasing in the U.S. right now due to the low price of oil, industry efforts to lift the current ban on exporting crude oil could result in a huge increase in fracked oil production. In turn, that oil will be put on trains that will head to coastal facilities and be loaded on tankers and sent to Asia. Despite all of the opposition and the years-long process to complete new regulations, as the Associated Press notes, it isn’t like the emergency first responders are comfortable with the current situation. With the known risks and the number of accidents, so far communities in the U.S have avoided disaster. But as Senator Franken pointed out, that has just been a matter of luck. “We’ve been lucky here in Minnesota and North Dakota and Wisconsin that we’ve not seen that kind of fatalities, but we don’t want this to be all about luck,” Sen. Franken said. As over 1,000,000 students in California start a new school year in schools where they can easily hear the train whistles from the oil trains passing through their communities, let’s all hope we keep this lucky streak going. BNSF Railway carried the Hess Corp.-owned rail car, which carried highly volatile Bakken crude oil from North Dakota and appears to have followed the law. President Barack Obama weighed and rejected using executive authority to curb the transport of this explosive crude oil, rich in butane and propane, because he decided North Dakota state law should be the controlling authority. But the law North Dakota passed in December and went into effect just last month, only requires less than 13.7 pounds-per-square-inch vapor pressure inside the tanker, despite explosions at lower pressures. That’s almost 40 percent more than the average vapor pressure among the 63 tanker cars that exploded July 6, 2013, at Lac-Megantic, Quebec. That disaster killed 47 people, some of whom could not be found because they were vaporized, and is driving recent federal and state rail car regulations. According to an Albany, N.Y., Times Union investigation, the average vapor pressure among 72 tanker cars in the Lac-Megantic train was 10 psi. Hess Corp. tested the crude just before loading at 10.8 psi, according to Associated Press reporters Matthew Brown and Blake Nicholson, in their follow-up story about the derailment at Heimdal, N.D. While federal regulations only require flash point and boiling point to be measured, North Dakota now requires vapor pressure be measured. But measuring and labeling the danger does not make transporting it safe. The U.S. Department of Transportation’s two divisions, the Federal Railroad Administration and the Pipeline and Hazardous Materials Safety Administration, are the regulating authorities overseeing railway transport of crude oil. Generally, the FRA is responsible for train car and rail safety, while the PHMSA inspects the proper testing of the oil. That determines the oil’s proper classification and its proper “packaging” in pressurized cars and their labeling. Other PHMSA duties include checking shipping documents to see if the shipper has self-certified the procedures properly as well as employee safety and handling training. The U.S. DOT initiated “Operation Safe Delivery” in August 2013, in reaction to the Lac-Megantic incident, although the Bakken oil boom dates to 2008. A federal rule-making process also began in August 2013. Those rules went into effect last week. PHMSA, as part of Operation Safe Delivery, took several samples of Bakken crude oil from rail-loading facilities, storage tanks and pipelines used to load rail cars. Several also were collected from cargo tanks. The first set of samples were taken August through November 2013 and the second set February through May 2014. The first set showed psi vapor pressure among a dozen samples ranging from 7.7 psi to 11.75 psi. A second set of 88 samples showed vapor pressure ranging from 10.1 psi to 15.1, with the average at about 12 psi. Only six of the 88 samples were at or exceeded North Dakota’s 13.7 psi. This means shippers are not required to treat most of the crude generated from the Bakken oil formation before loading it onto cars. The “Operation Safe Delivery Update,” available on the PHMSA website, also gives test results for propane, sulphur, hydrogen sulfide, methane and butane content. And although the report states, “PHMSA and FRA plan to continue … to work with the regulated community to ensure the safe transportation of crude oil across the nation,” the new rules that went into effect last week did nothing about regulating vapor pressure. Instead, the rules phase out weaker and older pressurized tanker cars, the DOT-111, by 2020, and phase in CPC-1232 cars. Last year in Lynchburg, Va. Experts in various news articles and public comment submitted during the federal rule-making stated the way to make transport safe is to refine the crude before shipping. That would involve building refineries near the extraction point, which experts pointed out would be expensive. But Thomas admitted the state law on crude treatment would reduce the danger only slightly. “The only solution for safety is stabilization, which evaporates and re-liquifies nearly all of the petroleum gases for separate delivery to refiners,” Thomas said. He points out owners and shippers in the Eagle Fork formation in Texas, voluntarily stabilize their crude before shipping. It’s more volatile than Bakken crude. Keeping the volatile gases in solution during shipping, while dangerous, is profitable. The PHMSA, however, requires butane and propane be removed from the crude before it is injected into pipelines, Thomas said. Comments to the federal rule-making pointed out Bakken oil is made more dangerous still by corrosive chemicals used in the fracking process. The crude is further treated with chemicals to make the molasses-like consistency easier to pump. Severe corrosion to the inner surface of the tanker cars, manway covers, valves and fittings have been recorded in various incidents, commentators said. The lack of federal regulations is not the only problem. Enforcement is minimal because there are only 56 inspectors, according to PHMSA spokesman Gordon Delcambre. Ten of those have been assigned to the North Dakota Bakken oil formation region, he said. In the PHMSA 2013 annual enforcement report, 151 cases were prosecuted and 312 civil penalty tickets were issued, resulting in $1.87 million in fines. The largest fine was $120,200. The report did not mention what the hazardous material was in 173 of the 463 enforcement actions. Only one enforcement action appeared to result from an inspection of “fuel oil” transport, which resulted in a $975 fine for incorrect “packaging” and failure to prove, through documents, employees had been given the required safety and hazardous material handling training. According to BNSF Railway’s report to the state Homeland Security and Emergency Management, required by a U.S. DOT emergency order since May 2014, a range of zero-to-six trains carrying at least 1 million gallons (30,000 gallons per car or about 35 cars or more) pass through Burlington each week.